A council in eastern Victoria has issued a warning about potentially dangerous pine cones falling from a tree in the town of Warragul. The 120-year-old heritage-listed bunya pine in the grounds of the Courthouse Hotel has been dropping huge pine cones. The Baw Baw Council says they weigh up to 10 kilograms each. Mayor Diane Blackwood says the cones are potentially lethal. "These things are enormous," she said. "They are the size of a watermelon, falling literally out of the sky from potentially 20 metres high. "So you wouldn't want to be under one, I tell you." The area was cordoned off while council workers removed the remaining pine cones. they should make it illegal in the name of your health and safety. 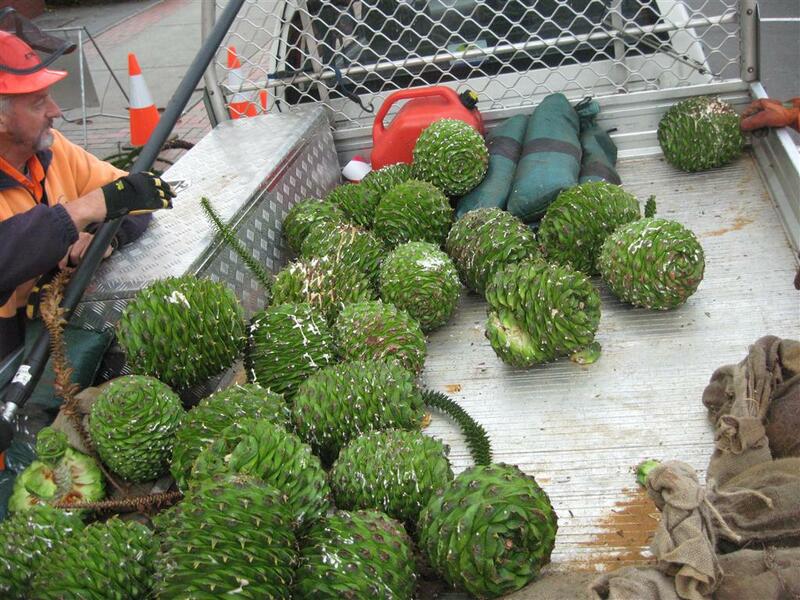 It's probably been dropping bunya nuts for a century, I wonder why it's a problem now all of a sudden. Probly because one fell near "Mayor Diane Blackwood"
there was a huge tree in the corner of Beatty Park, North perth. Havnt been past there in a while so not sure if its still there. haha I remember a few years ago in the Adelaide botanics there was a similar occurrence, they roped off the area all around the tree(s) because it was too dangerous. bunya nut's are tasty I hear, roasted or boiled. anyone tried it? nature should be left alone. i want one too !!!! brisbane city council routinely removes them so it isn't a problem, obviously southern councils aren't really down with the whole bunya pine thing since they are more of a novelty down yonder. My folks have a massive tree at their place, drops dozens of nuts every couple of years. I have smashed a few open but when I manage to get into each wedge, the actual seed part is not properly developed. Hollow etc and not very nut like. I'm not sure why. Quite a disappointment when you consider the effort required to break the thing open when freshly dropped. Not a novelty around where I am, but you would be unlucky to get hit. There's a lot of branches on the way down, you can hear them coming usually. 27 removed from that tree, not me just someone I know. I practically lived off them for a while. Head vs Bunya usually ends in tragedy.... broken head and broken bunya! They are from the Warragul tree, he may have kept them I don't know. I can give you his number if you like, they will probably be doing it again next year. I don't get many these days.